Where's My Water? : When House B becomes Plan A! When House B becomes Plan A! Thank you all so much for your lovely comments on my last post! It's such an exciting time for us - I keep looking at the photos of the house, and I love it so much! I think that it's just beautiful, I'm so glad you all seem to agree! As most of you guessed, in the end House B won the battle! House B has now become our plan A, and I couldn't be happier! As you can see, House B won in a landslide! When I said that House A was the perfect right-now house for us, I was really lying a little. I'm sorry about that. If it makes you feel any better, I was lying to myself too! I could just imagine being in that stunning open plan living room with a little balcony perfect for indulging in wine and cheese platters... but what was missing from that scene was the every day annoyances and inconveniences we would have to put up with. In the end, I came to the realisation that House B was a much better fit for us, not only in the future, but right now too. I am now the proud owner (or I will be in exactly 28 days!) of a beautiful three-bedroom two-bathroom double storey townhouse. As you might have seen from the picture in my previous post, it's a gorgeous little thing and I cannot wait to get moved in! Unfortunately it is currently tenanted on a fixed lease until the end of December. Once the lease is transferred we are going to discuss with the tentants the possibility of breaking it early, but in the worst case scenario we should be in our new home around Christmas time (ahh, the wait is going to kill me!). So now begins the fun of planning and buying new things to decorate the house! If the renters decide they want to stay until the end of their lease, we will have quite a while to plan and save up to buy everything that we need! I'm so excited. I'm so excited for you!! Congratulations! 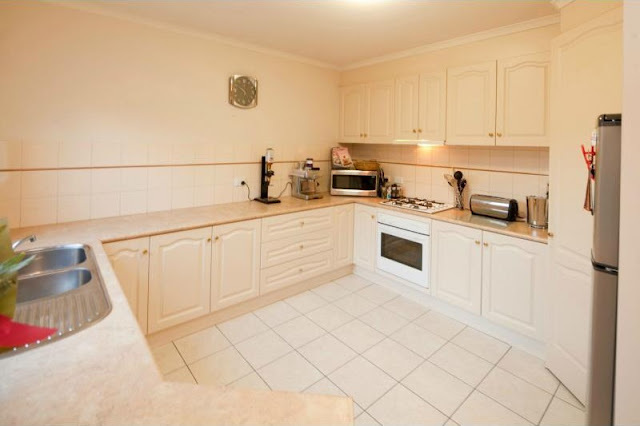 That kitchen is huge! You could do cartwheels in there! Awesome! That's so funny you say that. The first thing Liam said when he saw the kitchen was "I could breakdance in it!" It looks amazing, and woah at that pro/con comparison. Looks like you made a fantastic choice! I can't wait to read all about your home decorating!!! Agree with Emma's advice, until you're in a place it's hard to tell what you'll want to do with/to it. So exciting! And yes, live in your new home for a little while before doing/buying anything major - sometimes you can have a clear idea of what you want to do or buy but that can change once you get to 'know' your new home. This is such a fun time, thinking of all the things you can do! The kitchen is gigantic.. I am very jealous of that!! MASSIVE KITCHEN!! The place looks great and I am jealous too! With the tenant's (legally) you should be able to break the lease even if they don't want it, you will just have to give them a certain amount of notice. Oh, its a beauty. That kitchen would sell the house alone for me! Wordless Wednesday : Three Musketeers!